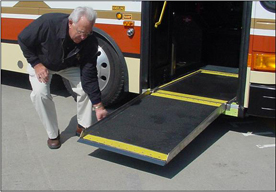 Rising Floor Ramp – Lift-U | A division of Hogan Mfg., Inc.
Lift-U® has developed a fold-out style ramp that features a Rising Floor. When the ramp is rotated to the ramp position, the “Rising Floor” is elevated to vehicle floor level and provides a smooth transition from the rising floor to the vehicle floor, eliminating the objectionable pocket edge. When stowed the floor surface of the fold-out ramp is flush with the vehicle floor. Emergency Operation – Quick, easy, manual manipulation with little lifting force. Ramp can be stopped and held in any position. Total Weight, approx. 200 lbs. Clear width at ramp surface – 30 Inches Minimum.